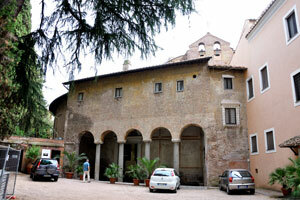 Basilica of Saint Mary in Cosmedin. 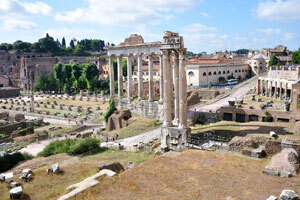 The Temple of Hercules Victor is located in the Forum Boarium. 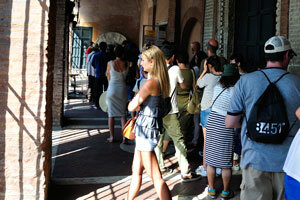 This queue of the tourists is inside the Basilica of Saint Mary in Cosmedin. 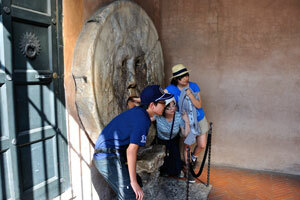 Tourists from China like to be photographed in front of the Mouth of Truth. 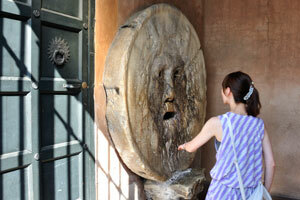 The Mouth of Truth is an image of a man-like face. 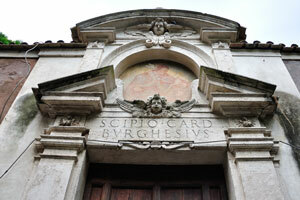 The Mouth of Truth is located in the portico of the church of Santa Maria in Cosmedin. 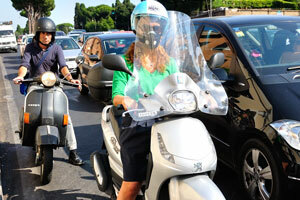 The Italian woman motorcyclist with luxuriant hairs of orange color. 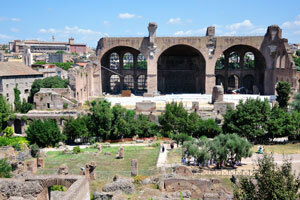 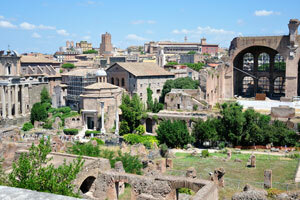 The Forum Boarium was the cattle forum of Ancient Rome. 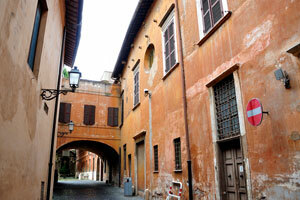 The street of Via di Santa Maria in Cosmedin. 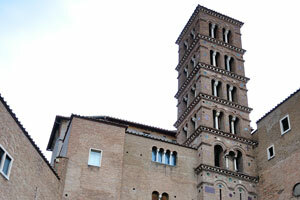 The bell tower of the Basilica of Saint Mary in Cosmedin. 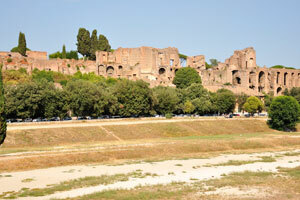 Ruins of the Circus Maximus. 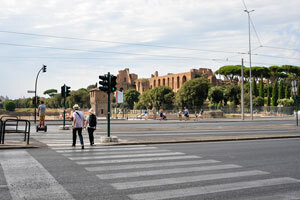 The street of Via del Circo Massimo. 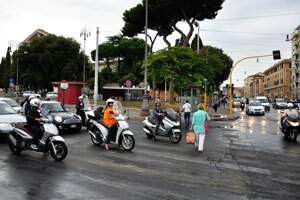 This pedestrian crossing is across the street of Viale Aventino. 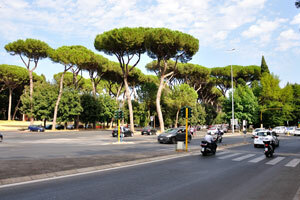 The street of Viale delle Terme di Caracalla. 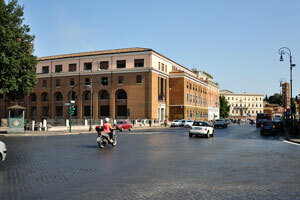 The five-way intersection connects the Via dei Cerchi, Viale Aventino and Via di San Gregorio streets. 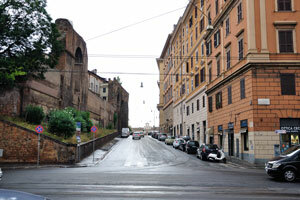 The street of Via di San Gregorio. 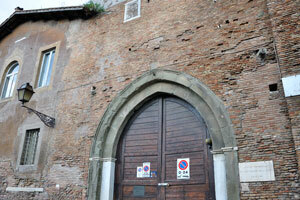 Stair and external facade of San Gregorio Magno al Celio. 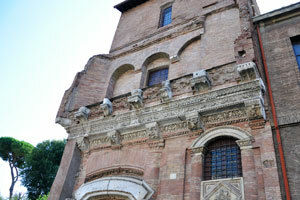 Carved dragons and eagle adorn the facade of San Gregorio Magno al Celio. 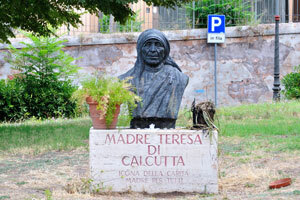 Memorial to Mother Teresa of Calcutta is located on the square of San Gregorio. 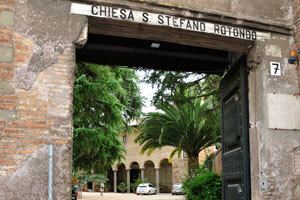 The street of Clivo di Scauro. 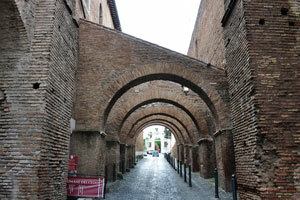 Strolling under the arches of the Clivo di Scauro street. 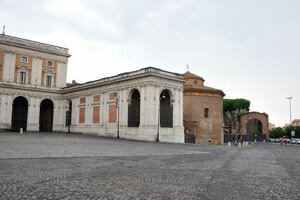 Santi Giovanni e Paolo is an ancient basilica church. 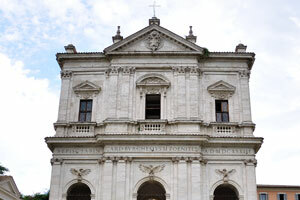 The facade of Santi Giovanni e Paolo church. 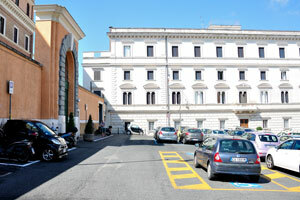 The northern entrance to the territory of Villa Celimontana. 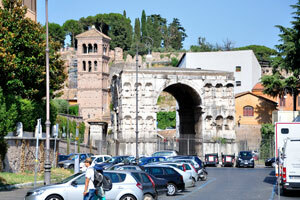 The Arch of Dolabella is an ancient Roman arch. 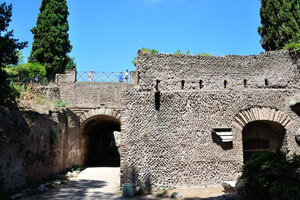 The Arch of Dolabella was built by senatorial decree in 10 AD. 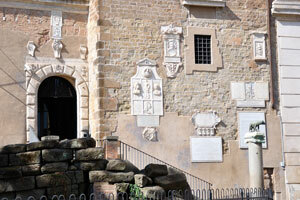 The gate of the church of San Tommaso in Formis is located next to the Arch of Dolabella. 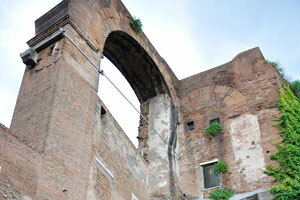 Nerone Aqueduct and the church of Santa Maria in Domnica. 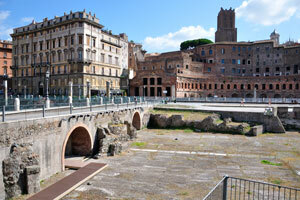 The street of Via Santo Stefano Rotondo is in the area of Nero's Aqueduct. 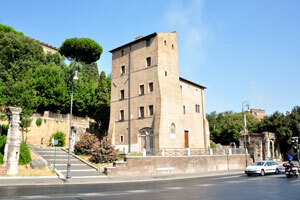 Santo Stefano Rotondo is an ancient basilica and titular church. 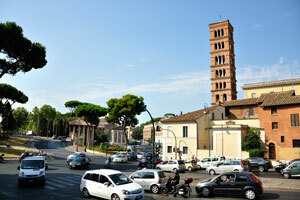 The Basilica of St. Stephen in the Round on the Caelian Hill. 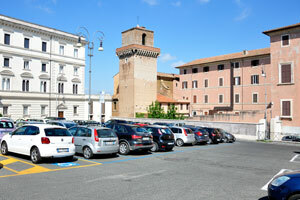 The San Giovanni Addolorata Hospital is one of the biggest hospitals in Central Italy. 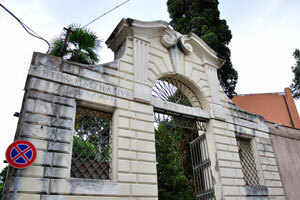 One of the entrances to the hospital of Azienda Ospedaliera San Giovanni Addolorata. 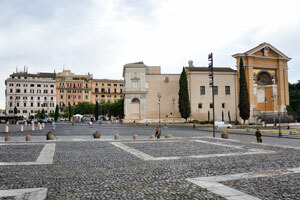 The square of John Paul II. 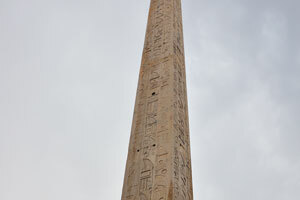 Lateran Obelisk is the largest standing ancient Egyptian obelisk in the world, weighing over 230 tons. 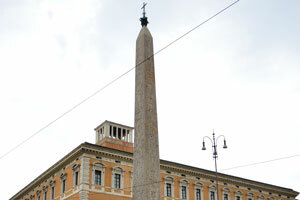 Obelisk of Thutmosis III was brought to Rome in 357 to decorate the spina of the Circus Maximus. 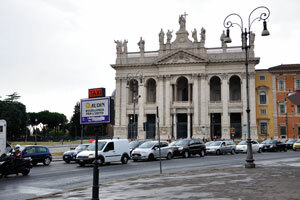 The rear side of the Archbasilica of St. John Lateran from the John Paul II square. 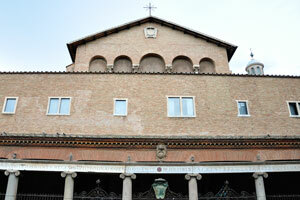 The domed octagonal Lateran Baptistery. 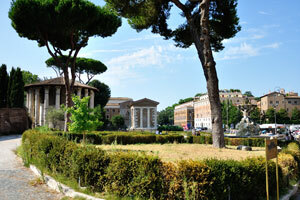 The Lateran Palace is an ancient palace of the Roman Empire. 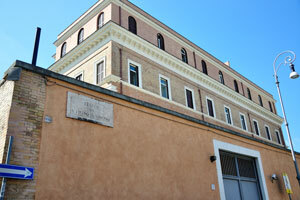 This apartment house is opposite to the square of John Paul II. 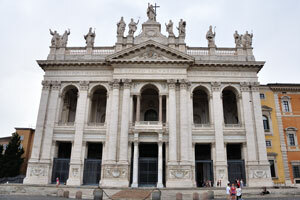 Stone carvings are on the inner walls of the portico of St. John Lateran Archbasilica. 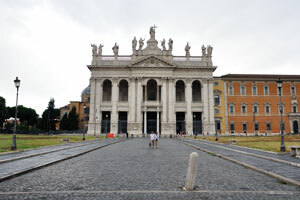 The huge portico of St. John Lateran Archbasilica. 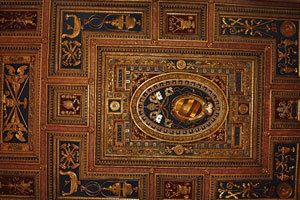 The ceiling of the portico of St. John Lateran Archbasilica. 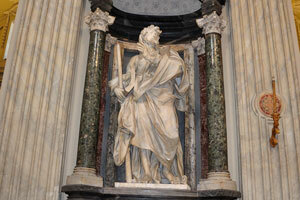 The statue is in the portico of St. John Lateran. 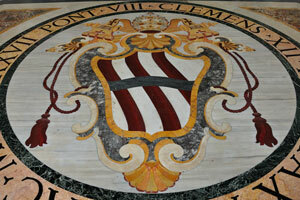 The coat of arms is on the floor in the portico of St. John Lateran. 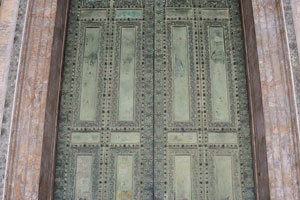 Door at the Lateran Papal Basilica. 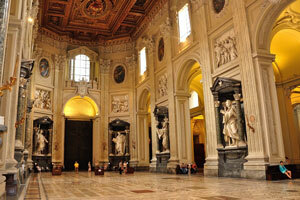 Amazing atrium of the Lateran Papal Basilica. 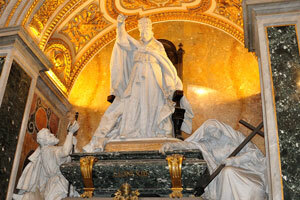 Statue of St. Simon by Francesco Moratti in the Archbasilica of St. John Lateran. 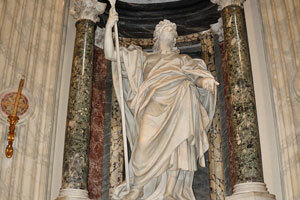 Statue of St. Jude by Lorenzo Ottoni in the Archbasilica of St. John Lateran. 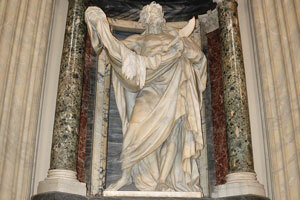 Statue of St. Bartholomew by Pierre Le Gros the Younger in the Archbasilica of St. John Lateran. 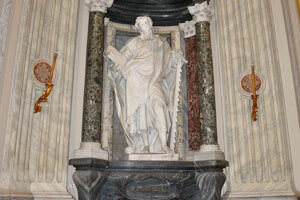 Statue of Philip the Apostle by Giuseppe Mazzuoli in the Archbasilica of St. John Lateran. 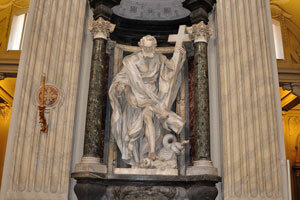 Statue of St. James the Less by Angelo de Rossi in the Archbasilica of St. John Lateran. 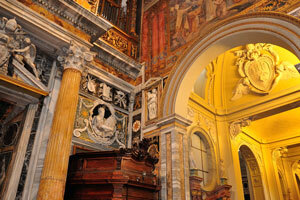 The elegant baldacchino over the high altar, which looks out of place in its present surroundings, dates from 1369. 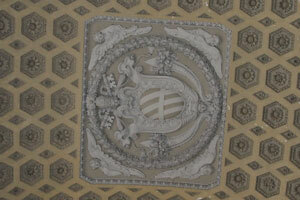 The ceiling of St. John Lateran Archbasilica. 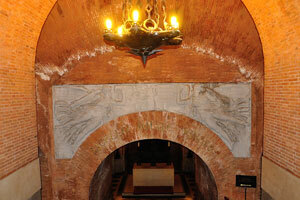 Six of the twelve niches for sculptures of the Apostles. 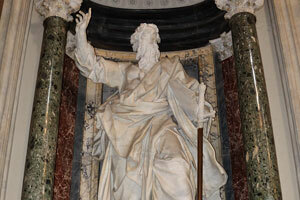 Statue of St. Paul by Pierre-Etienne Monnot. 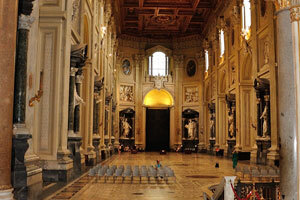 The interior of the Archbasilica. 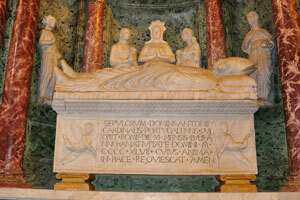 This statue decorates the tomb of Pope Leo XIII. 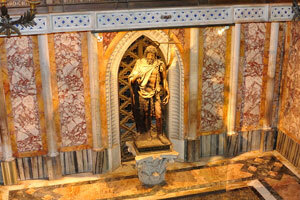 The inscription reads: “Statue of St. John the Baptist and Tomb of Pope Martin V”. 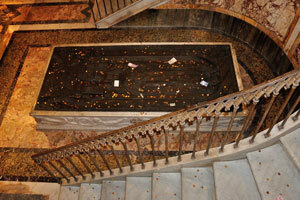 The tomb of Pope Martin V is covered by coins. 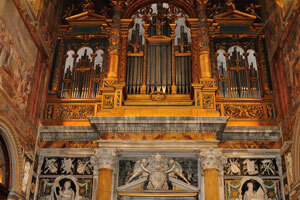 The organ was designed by Luca Blasi of Perugia in 1598, with angels, cherubs and reliefs by Giovanni Battista Montano. 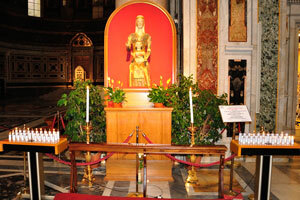 The wooden statue of “Mary Mother of God”. 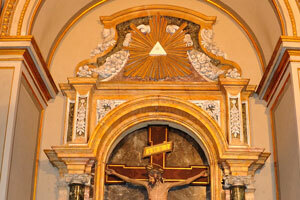 The symbol of the all-seeing eye in a triangle is placed above Jesus. 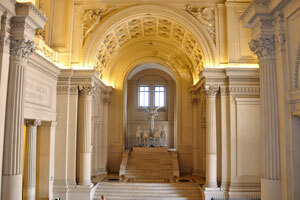 Beautiful stone wall carvings are inside the Archbasilica. 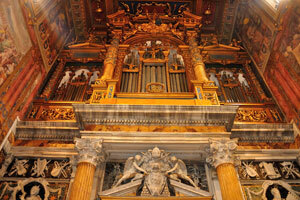 The organ of the Archbasilica. 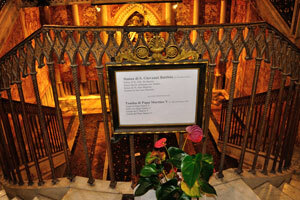 Tomb of Cardinal Antonio Martino de Chaves. 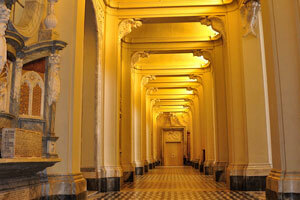 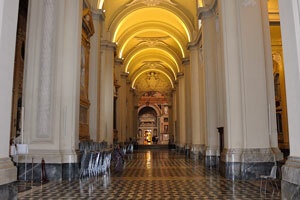 Spacious corridors of the Archbasilica. 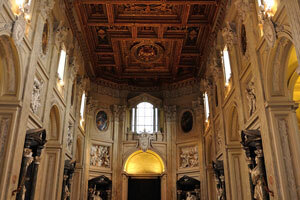 The bright interior of the Lateran Basilica. 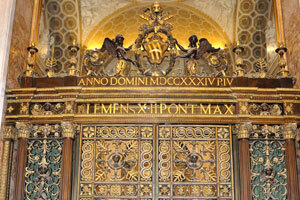 The inscription reads: Clemens XII Pont Max. 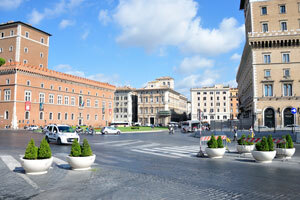 This square is located in front of the Papal Archbasilica of St. John in the Lateran. 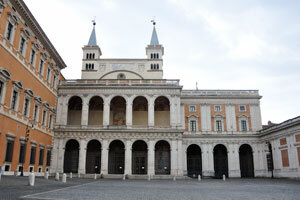 Facade of the Papal Archbasilica of St. John in the Lateran. 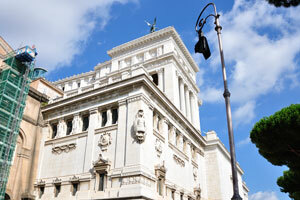 The Archbasilica and its adjoining buildings have an extraterritorial status as one of the properties of the Holy See. 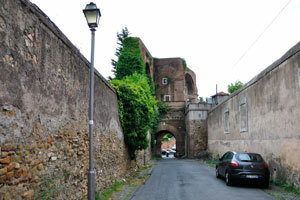 Porta San Giovanni is a gate in the Aurelian Wall of Rome, named after the nearby Basilica of St. John in the Lateran. 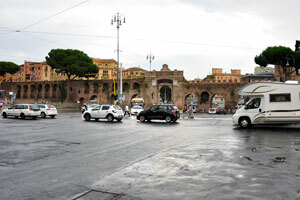 This intersection is adjacent to Piazza di Porta San Giovanni. 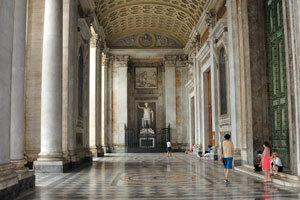 Unlike all other Catholic basilicas, this one is titled Archbasilica. 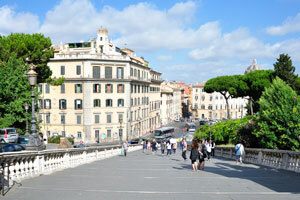 The street of Via Domenico Fontana. 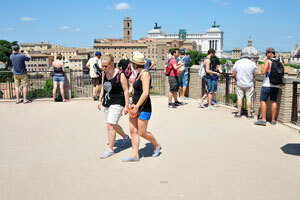 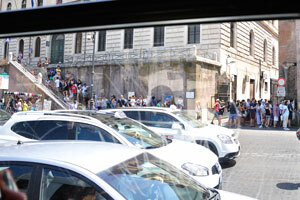 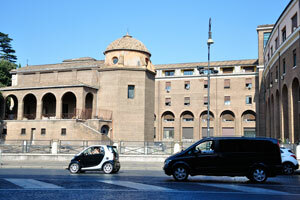 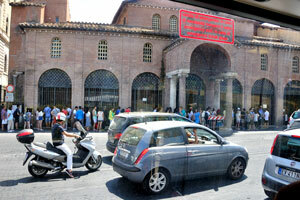 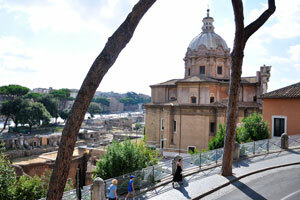 We see the long queue of tourists near the Basilica of Saint Mary in Cosmedin from the bus. 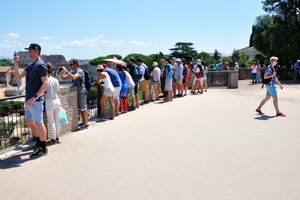 The queue of the tourists wishing to be photographed with the Mouth of Truth could be very long. 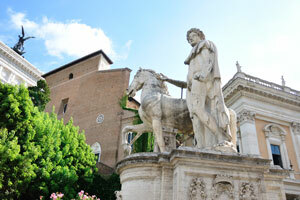 Fountain of Piazza d'Aracoeli is located at the base of the Capitoline Hill, in the little square with the same name. 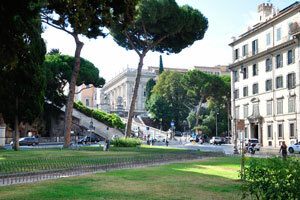 This lawn is located at the base of the Capitoline Hill. 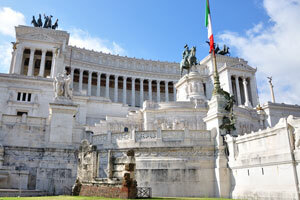 Altar of the Fatherland, also known as the National Monument to Victor Emmanuel II. 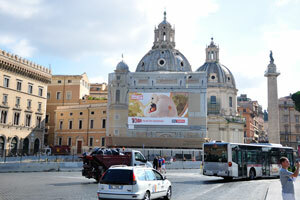 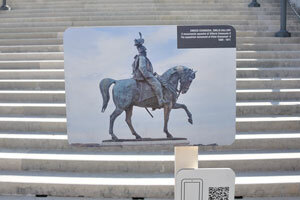 An advertising board is on the Piazza Venezia. 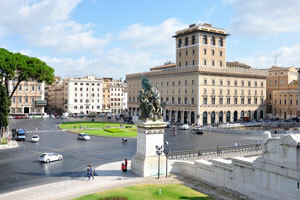 Piazza Venezia is the central hub of Rome in which several thoroughfares intersect. 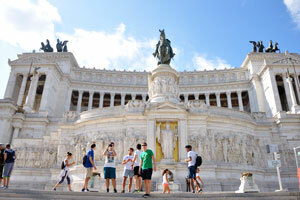 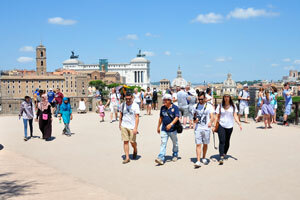 Tourists at the background of the Monumento Nazionale a Vittorio Emanuele II. 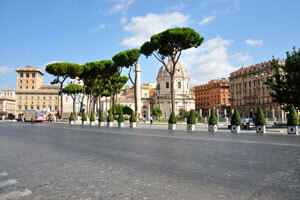 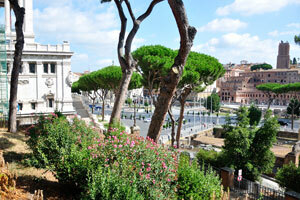 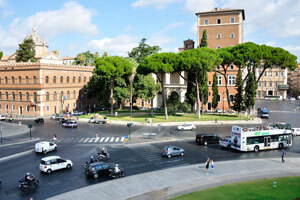 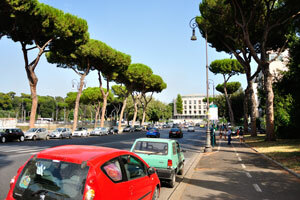 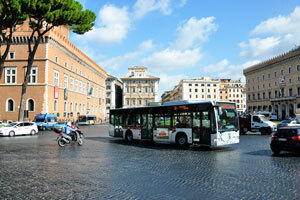 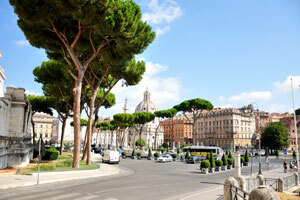 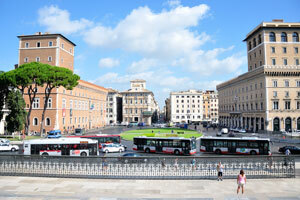 Piazza Venezia is at the foot of the Capitoline Hill and next to Trajan's Forum. 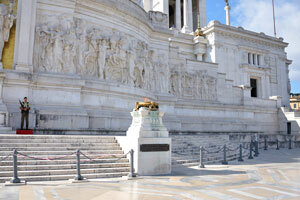 Tomb of the Unknown Soldier is under the statue of goddess Roma. 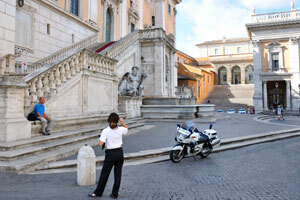 The eternal flame at the Tomb of the Unknown Soldier. 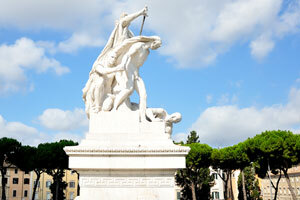 Statue at the foot of the National Monument to Victor Emmanuel II. 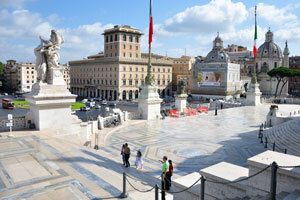 Piazza Venezia, as seen from the Monument to Vittorio Emanuele II. 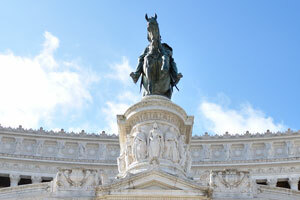 An equestrian sculpture of Victor Emmanuel. 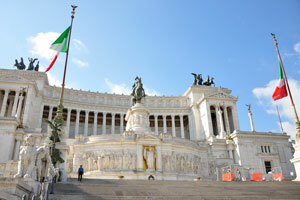 The description of the equestrian sculpture of Victor Emmanuel. 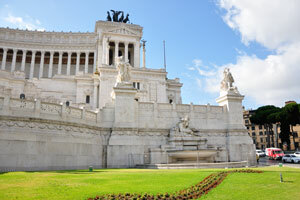 We are inside the Il Vittoriano monument. 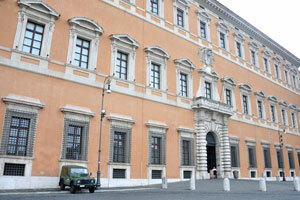 Admission to the Italian Military museum is free. 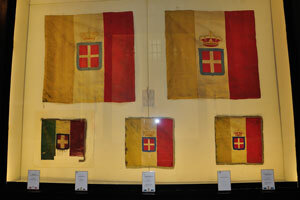 Flags are inside of the Il Vittoriano museum. 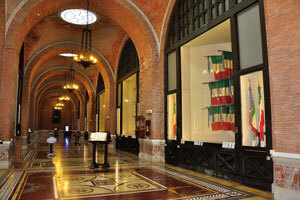 Red brick walls of the Il Vittoriano museum. 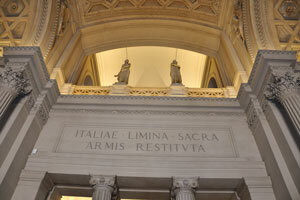 The sculpture of winged Victory with horses in the Italian Military museum. 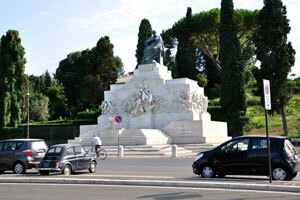 At the foot of the National Monument to Victor Emmanuel II. 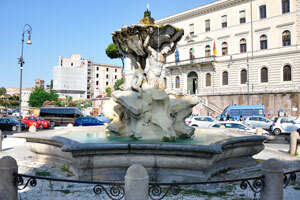 The Tyrrhenian Sea fountain at the right side of the National Monument to Victor Emmanuel II. 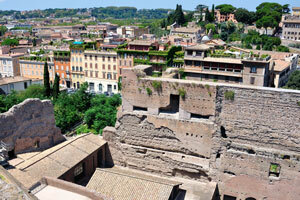 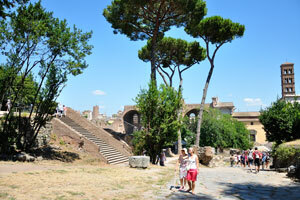 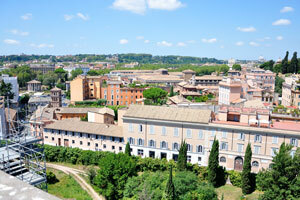 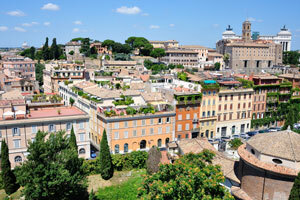 Insula Romana is found at the foot of the Capitoline Hill. 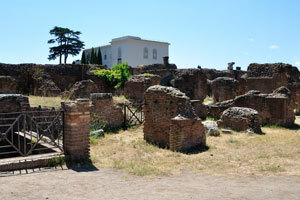 Dwellings at the first floor of the Insula Romana. 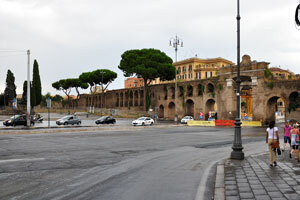 The street of Via del Teatro di Marcello. 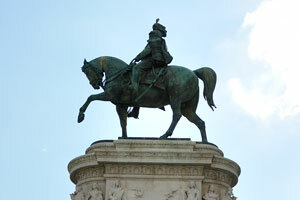 Statue of Castor on top of the Cordonata. 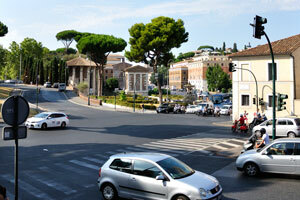 Cordonata is a sloping road composed of transversal stripes. 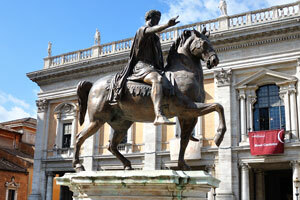 In the center of the Capitoline Square stands an equestrian statue of the Roman Emperor Marcus Aurelius. 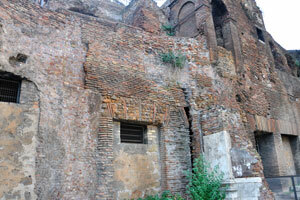 The facade of Senatorial Palace. 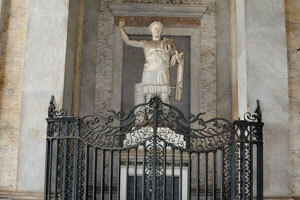 Marforio statue is found inside the “New Palace” which belongs to the Capitoline Museums group. 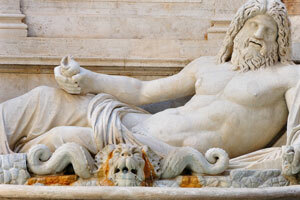 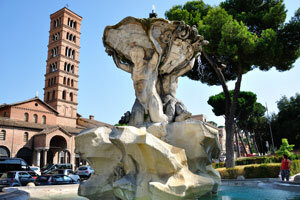 The fountain of Dea Roma “Goddess Roma” decorates the facade of Senatorial Palace. 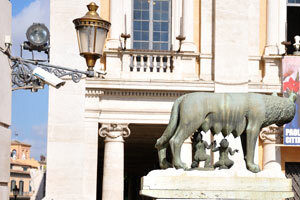 Modern replica of the Capitoline Wolf, a view from the back side. 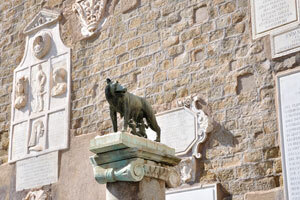 The wall of Senatorial Palace which is behind the Capitoline Wolf. 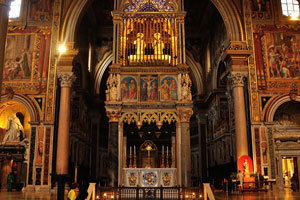 The Basilica of St. Mary of the Altar of Heaven. 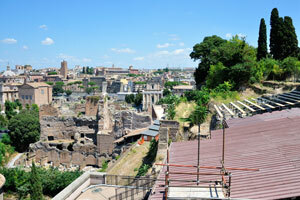 A viewing platform is on top of the hill where the Palace of Tiberius is situated. 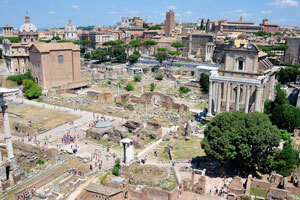 Forum of Caesar and Forum of Augustus. 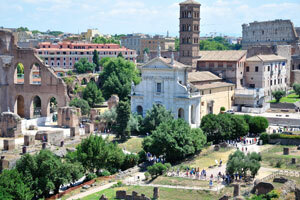 Church of Saints Luke and Martina is standing amid the ruins of Forum of Caesar. 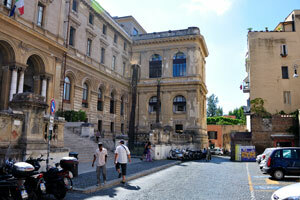 The street of Via di San Pietro in Carcere. 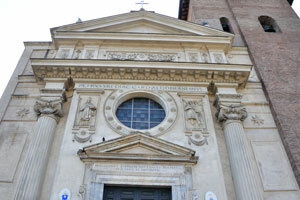 Church of Saints Luke and Martina. 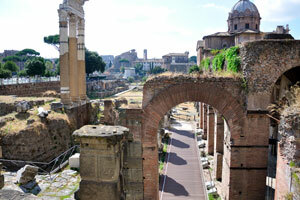 The Arch of Septimius Severus is found at the northeast end of the Roman Forum. 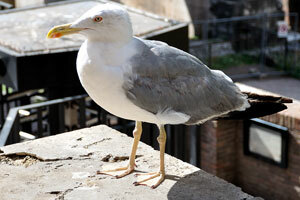 A seagull at the northeast end of the Roman Forum. 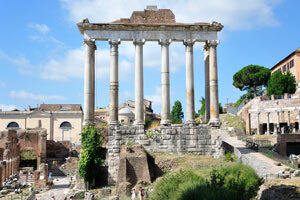 The Temple of Saturn is a temple to the god Saturn in ancient Rome. 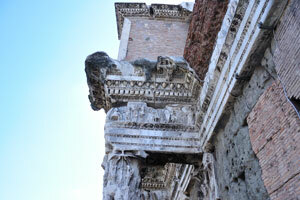 Stone carvings of the Arch of Septimius Severus. 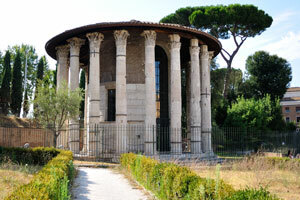 The original dedication of a temple to Saturn was dated to 497 BC. 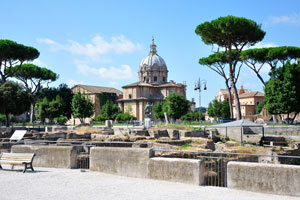 The Basilica Julia was a public building used for meetings and other official business during the early Roman Empire. 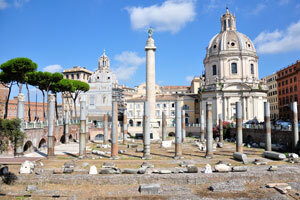 Three huge columns are all that is left from the Temple of Castor and Pollux. 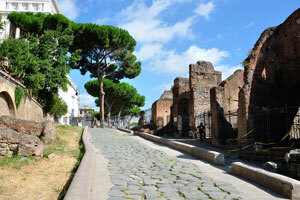 The street of Clivo Argentario. 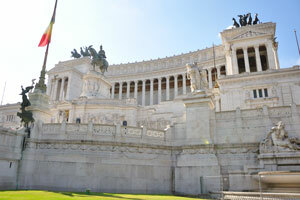 Quadriga is on the top of the National Monument to Victor Emmanuel II. 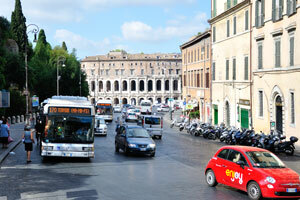 The street of Via dei Fori Imperiali. 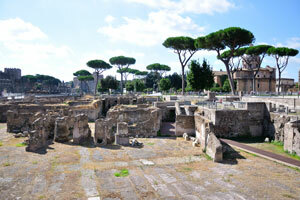 The forum of Caesar and the temple of Venus Genetrix. 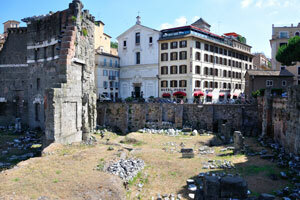 Forum of Caesar and Church of Saints Luke and Martina. 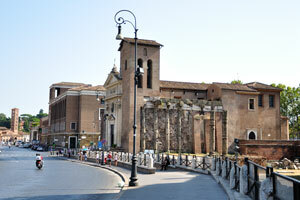 Church of the Most Holy Name of Mary at the Trajan Forum. 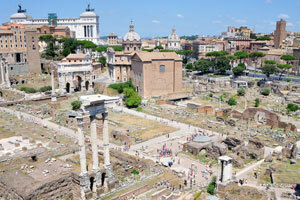 Trajan's Forum was the last of the Imperial fora to be constructed in ancient Rome. 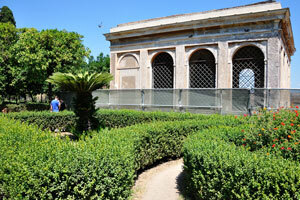 The Casa dei Cavalieri di Rodi “House of the Knights of Rhodes” is an ancient building. 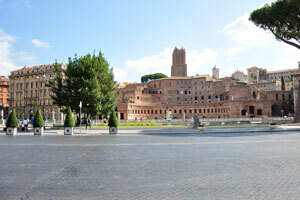 The square of Trajan's Forum. 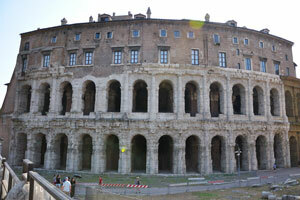 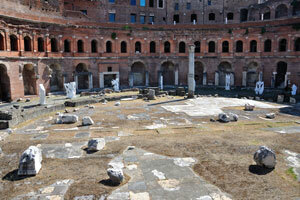 The Basilica Ulpia was an ancient Roman civic building located in the Forum of Trajan. 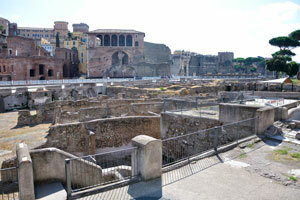 The Forum of Trajan and the remains of medieval houses. 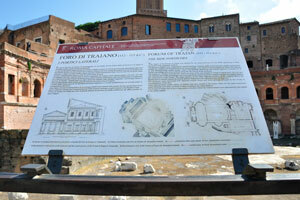 A description of the Forum of Trajan. 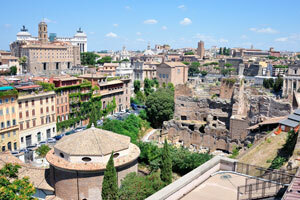 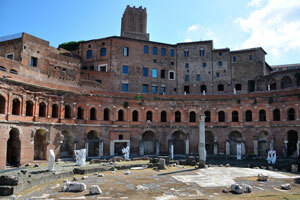 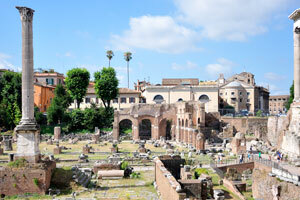 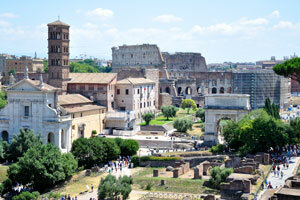 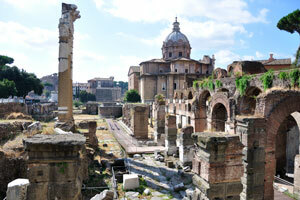 Trajan's Market reveals new treasures and insights about Ancient Roman architecture. 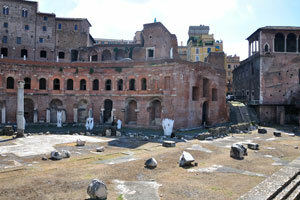 The arcades in Trajan's Market were the administrative offices for Emperor Trajan. 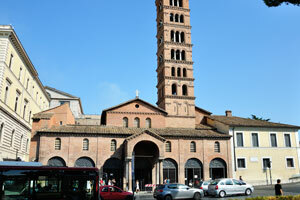 The church of Santi Luca e Martina was initially dedicated to Saint Martina, martyred in 228 AD. 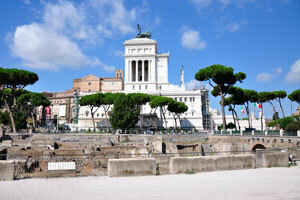 The National Monument to Victor Emmanuel II as seen from Forum of Trajan. 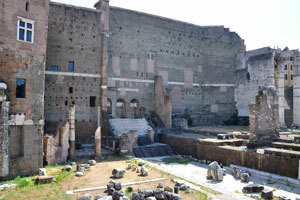 The Forum of Augustus is one of the Imperial forums of Rome, built by Augustus. 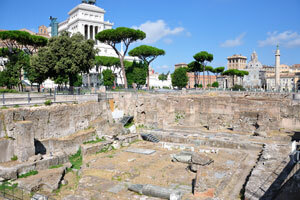 The temple of Mars Ultor is located in the Forum of Augustus. 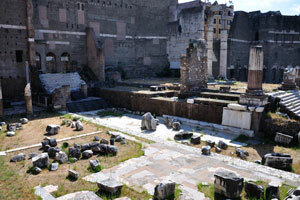 Remains of Forum of Augustus with the Temple of Mars Ultor. 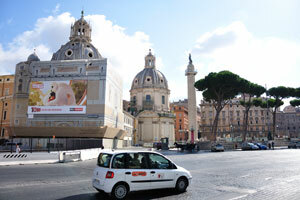 Forum of Augustus and the National Monument to Victor Emmanuel II is on the background. 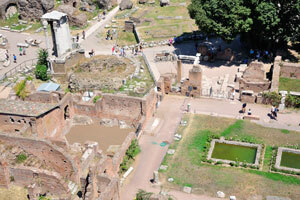 Forum of Augustus and Forum of Nerva. 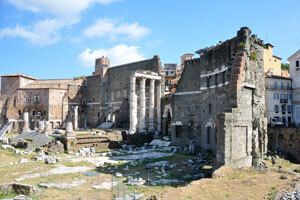 The lateral walls of the Forum of Nerva were lined with paired columns “Le Colonnacce”. 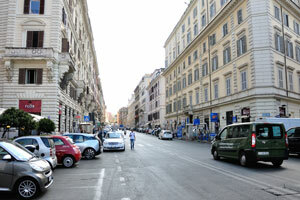 The street of Via Cavour. 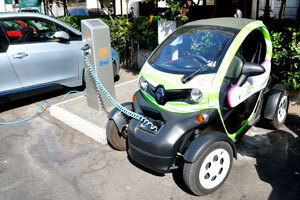 “Enel” electric vehicle charging station supplies electrical energy for electric cars. 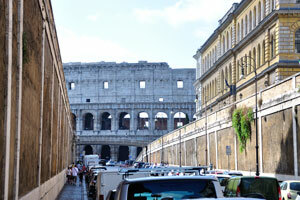 View of Colosseum from the street of Via degli Annibaldi. 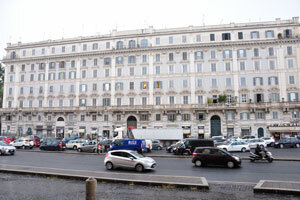 This building is located on the street of Via Eudossiana, 17. 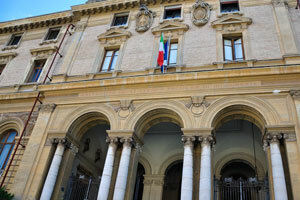 Sapienza University “Faculty of Engineering”. 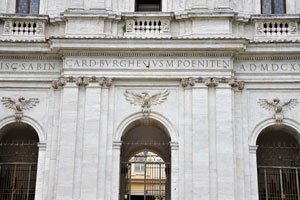 An inscription reads “Piazza di San Pietro in Vincoli”. 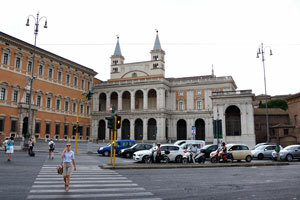 Maronite College is located on the square of Saint Peter in Chains “Piazza di San Pietro in Vincoli”. 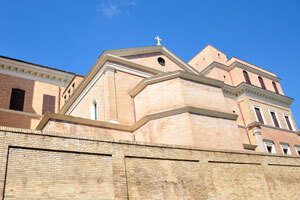 San Francesco di Paola ai Monti is a titular church dedicated to St Francis of Paola. 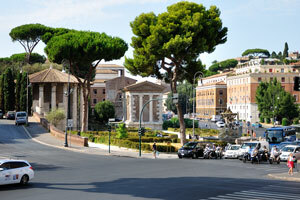 The street of Via Eudossiana. 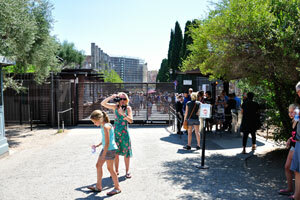 At the entrance to the Roman Forum. 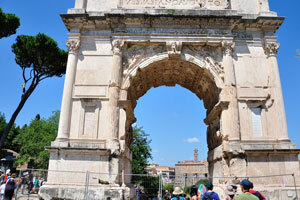 The Arch of Titus is a triumphal arch with a single arched opening. 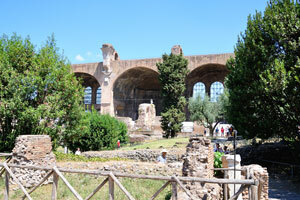 Porticus Margaritaria in the Roman Forum. 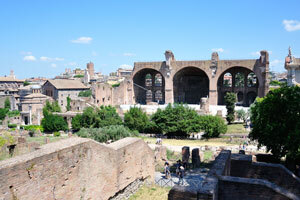 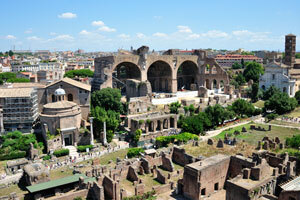 The Basilica of Maxentius and Constantine is an ancient building in the Roman Forum. 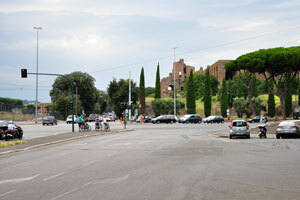 The street of Via Sacra “Sacred way or road” in the Roman Forum. 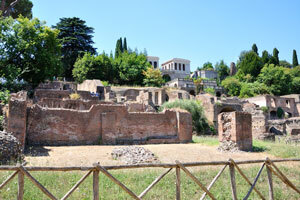 House of the Vestals in the Roman Forum. 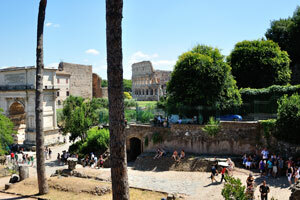 View of the Arch of Titus and the Colosseum from the Palace of Tiberius. 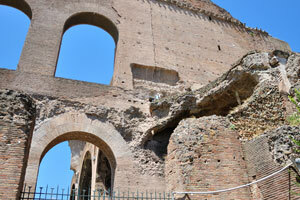 Basilica of Maxentius as seen from the Palace of Tiberius. 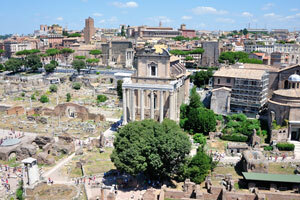 Temple of Romulus in the Roman Forum. 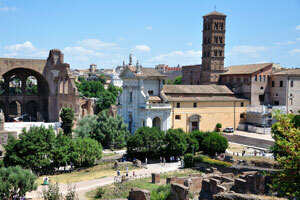 The Basilica of Maxentius and Constantine is the largest building in the Roman Forum. 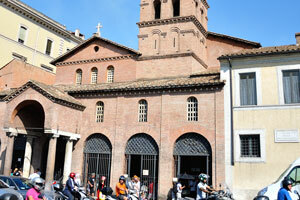 The church of Santa Francesca Romana is situated in the Roman Forum. 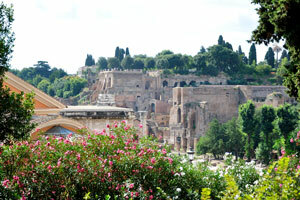 Amazing landscape design surrounds the Palace of Tiberius. 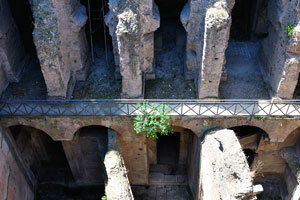 This walkway is along the side wall of Elagabalium. 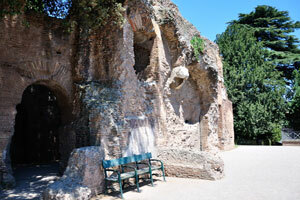 A bench to rest on while exploring the ancient Roman architecture. 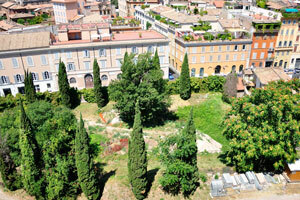 Massive ancient constructions are somewhere near the Farnese Gardens. 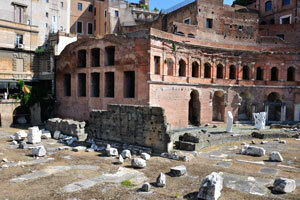 Domus Flavia is the palace of the Flavian family, built for the emperor's public life. 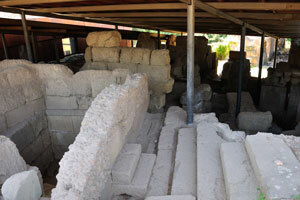 Excavations are still in progress near the Palace of Tiberius. 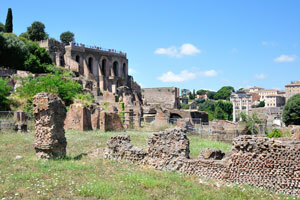 The Temple of Hercules Victor as seen from the Palatine Hill. 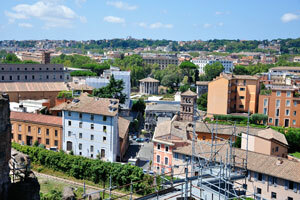 The church of Santa Maria in Cosmedin as seen from the Palatine Hill. 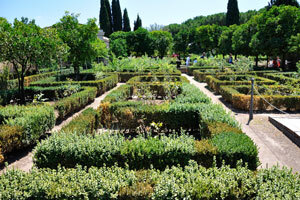 The garden of the orthodox church of Saint Theodore of Amasea. 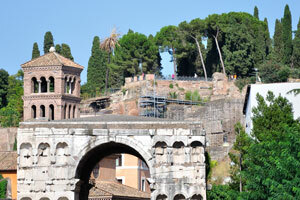 View of the Arch of Janus from the Palatine Hill. 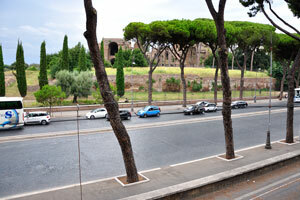 View of the street of Via di San Teodoro from the Palatine Hill. 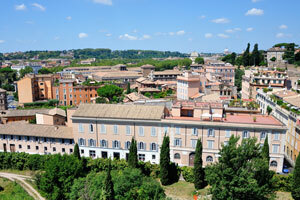 The orthodox church of Saint Theodore of Amasea as seen from the Palatine Hill. 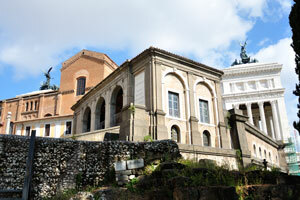 The Temple of Antoninus and Faustina as seen from the western side of Palace of Tiberius. 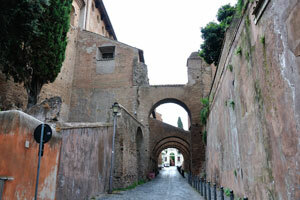 View of the street of Via di San Teodoro from the western side of Palace of Tiberius. 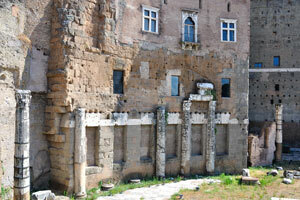 View from the western side of Palace of Tiberius in the western direction. 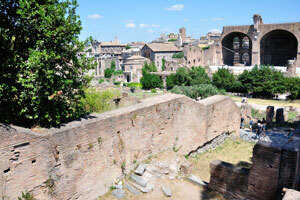 The best viewing platform which is located above the Roman Forum. 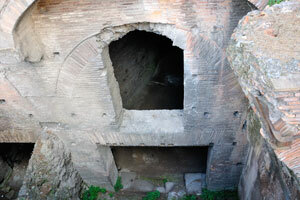 An internal structure of the Palace of Tiberius. 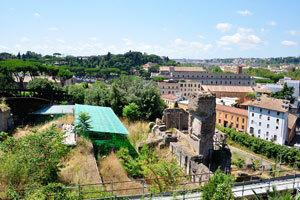 The orthodox church of Saint Theodore of Amasea as seen from the viewing platform of the Palace of Tiberius. 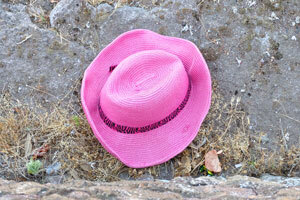 Someone lost his hat while gazing on the tourist attractions of the Roman Forum. 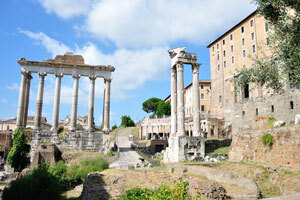 The Temple of Antoninus and Faustina is the heart of the Roman Forum. 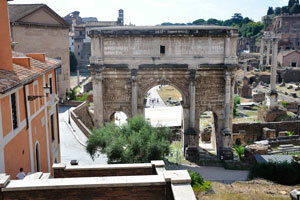 The Arch of Septimius Severus as seen from the viewing platform of the Palace of Tiberius. 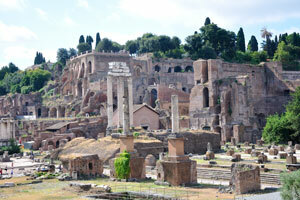 The Temple of Vesta as seen from the viewing platform of the Palace of Tiberius. 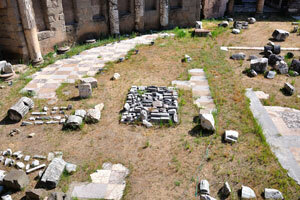 House of the Vestals is a large courtyard surrounded by columns. 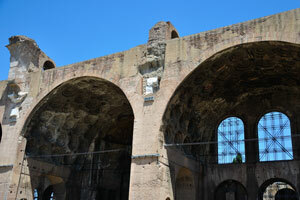 The Basilica of Maxentius and Constantine. 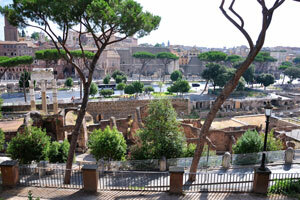 View of the Colosseum from the viewing platform of the Palace of Tiberius. 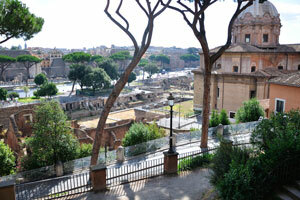 View of the Santa Francesca Romana church from the viewing platform of the Palace of Tiberius. 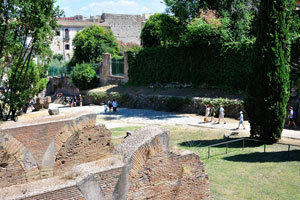 The breathtaking viewing platform of the Palace of Tiberius is full of tourists. 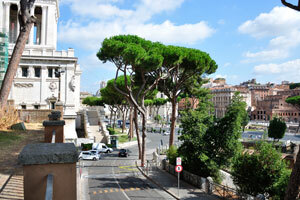 The Monument to Vittorio Emanuele II as seen from the viewing platform of the Palace of Tiberius. 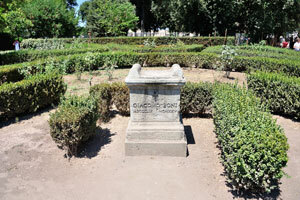 Farnese Gardens: In the center of the rose garden is the tomb of Italian archaeologist Giacomo Boni (1859-1925). 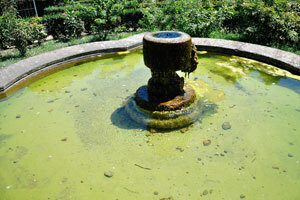 Fountain is in the Farnese Gardens. 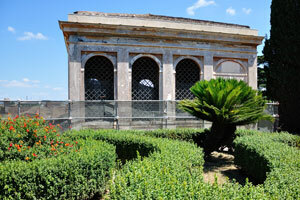 A Sago palm was planted in the Farnese Gardens. 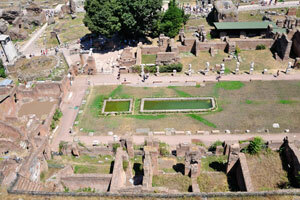 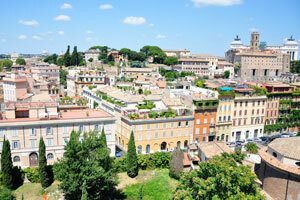 The Farnese Gardens were created in 1550 on the northern portion of Palatine Hill by Cardinal Alessandro Farnese. 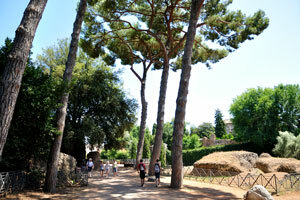 Some tall trees of the Palatine Hill grow up to the skies. 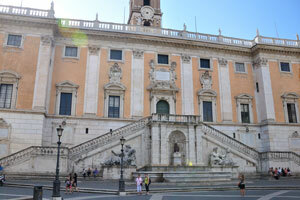 This stairway leads to the Farnese Gardens. 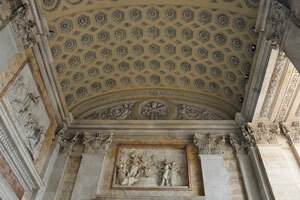 The ceiling of the Basilica Nova in the Roman Forum. 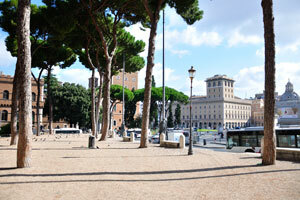 This sidewalk leads from the Roman Forum to the Colosseo metro station. 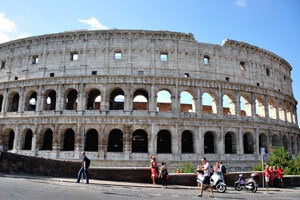 Colosseum as seen from the main entrance to the Colosseo metro station. 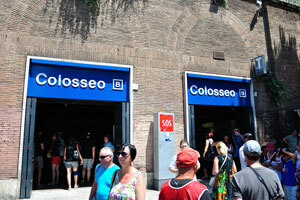 The main entrance to the Colosseo metro station on the Via Del Colosseo. 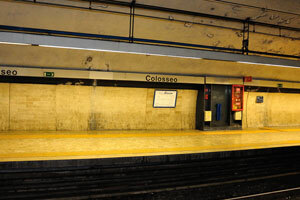 Colosseo is a station of the Rome Metro. 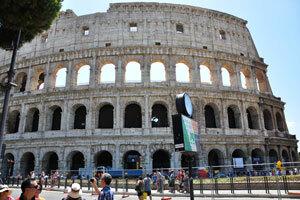 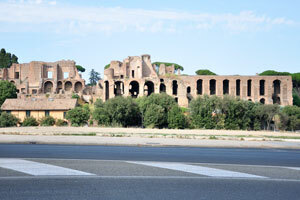 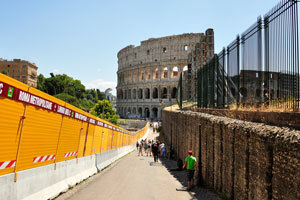 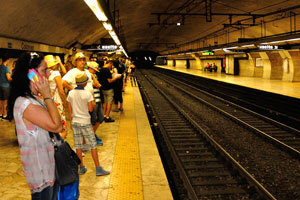 Colosseo station was opened on 10 February 1955 and is located, as its name suggests, near the Colosseum. 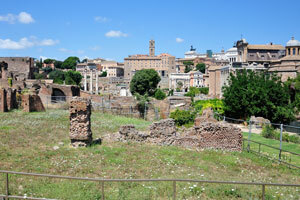 View of the Cordonata on the Capitoline Hill. 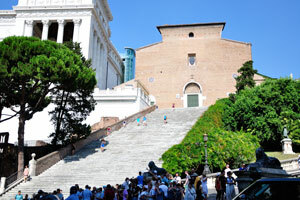 Monumental staircase has a total of 124 steps, it was designed in 1348 by Simone Andreozzi. 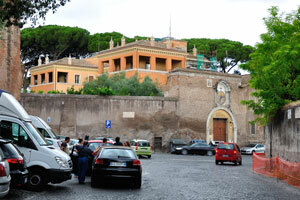 Church of “St Nicholas in prison”. 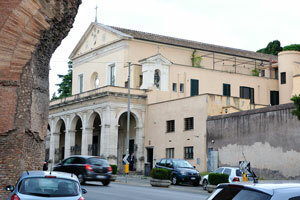 The facade of church of San Nicola in Carcere. 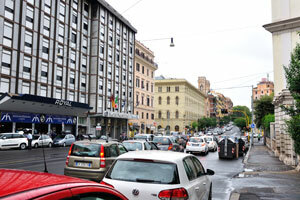 The street of Via Luigi Petroselli. 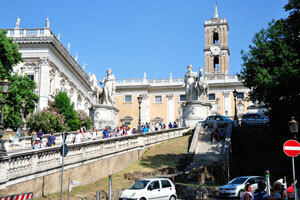 Sant'Omobono is a church at the foot of the Capitoline Hill. 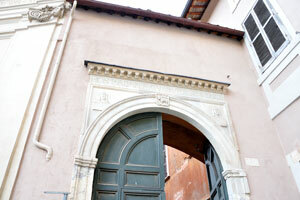 The library of Casa dei Crescenzi. 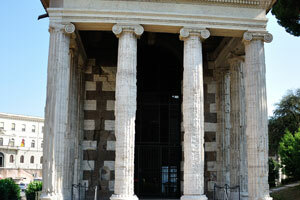 Temple of Portunus in the Forum Boarium. 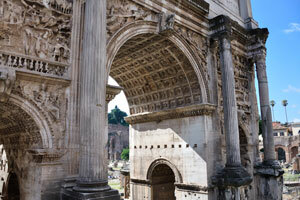 The Arch of Janus and one of the viewing platforms of the area which belongs to the palace of Tiberius. 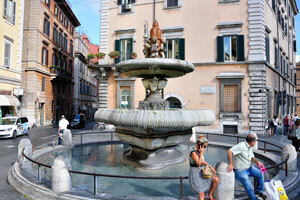 The fountain of the Tritons is located in front of the basilica of Santa Maria in Cosmedin. 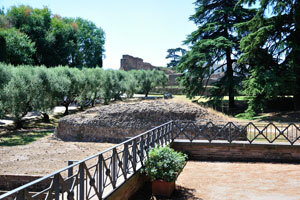 The basilica of Santa Maria in Cosmedin as seen from the fountain of the Tritons.